Documents released by the American whistle-blower Edward Snowden claim that Britain spied for several years on the Argentine government. According to reports in the Argentine media, Britain was concerned that Argentina could launch another attempt to reclaim the Falkland Islands. 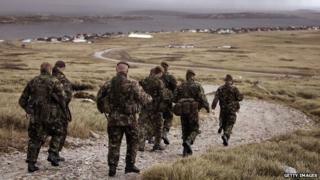 Last month the British government announced it was upgrading its military presence on the islands. The official documents released by Mr Snowden are said to allege that British agents were actively spying on Argentina between 2006 and 2011. The former CIA worker, who now lives in Russia, has previously leaked sensitive information about US surveillance programmes. The BBC's South America correspondent Wyre Davies says there has not been any formal response yet from either the British or Argentine government to the allegations, which have been published by a number of Argentine news agencies. Defence Secretary Michael Fallon said last month that Britain will spend £280m over the next 10 years on renewing and beefing up its defences of the Falkland Islands, to take into account "any future and possible threats" to the islands. Meanwhile, Argentine foreign ministry officials say they will prosecute oil companies operating near the Falkland Islands, which are known as Las Malvinas in South America. And Argentine President Cristina Fernandez said Britain should spend more helping its own poor than on defending the Falkland Islands. Delivering a speech to honour her country's war dead in the conflict, she said: "What a paradox when there are more than one million Britons eating at the food banks they have had to open in one of the most powerful countries in the world. "Don't worry. Don't spend another pound sterling on defending the Malvinas. "Spend your money feeding the English, on providing jobs for your young people and a better quality of life for the British, because we are not a threat to anyone." She has also ordered the declassification of all her country's secret documents on the war. Britain rests its case on its long-term administration of the Falklands and on the principle of self-determination for the islanders, who are almost all of British descent.